If you are a true golf lover and want somewhere to practice whatever the weather, our synthetic putting greens are the ideal solution. Made from artificial grass that is produced 100% from polyethylene, making it completely recyclable after it exceeds its usable lifespan, our putting greens look and feel like the real deal. 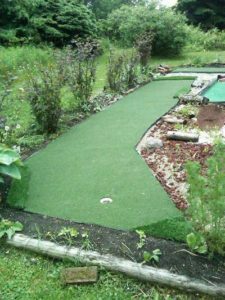 Our greens are completely customizable and can be produced in whatever size and layout that you desire, and feature a border that allows you to practice your chipped shots too. True Ball Roll – Our putting greens play just like those that feature real grass, with a true ball roll that allows you to stop worrying about the surface and concentrate on perfecting your stroke. Indoors or Outside – The installation of our putting greens can be customized to your requirements and it’s possible to have them laid down either indoors or outdoors. Zero Maintenance – Maintaining a putting green made from real grass is almost impossible for the average homeowner since it requires the use of specialist equipment and a significant time investment; neither of these are necessary with our putting greens, which remain in perfect condition year round. The putting greens offered by Premier Custom Grass are much more than an area of artificial grass; they look, and more importantly, play like a real golf green. All greens are produced using the latest manufacturing processes and then installed to strict specifications to ensure high performance, longevity and total satisfaction.